Meridian Township has a variety of attractions to offer its community, ranging from various artworks throughout the township to historical places that are unique to citizens in the area. The township even offers a self-guided walking tour that people can go on to gain historical information on the township. Here are three places that I visited, each listed under the tour guidelines, that citizens of the community or travelers can visit during their stay in Meridian Township. The Three Disco Fish that were installed at Wonch Park early this month. township and recently three “Disco Fish” were installed in Wonch Park. 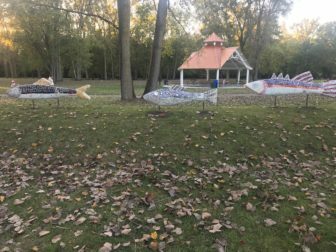 The three fish were purchased in 2009, after the Downtown Development Authority granted the township money to host an art walk in Downtown Okemos. The township purchased the fish from Tom Rudd, who is an artist from Calumet, Michigan. He called them the Mosaic Glass Over Mixed Media. According to Brixie, the township wanted to keep them in the downtown area and they thought Wonch Park would be a good location for the fish. Since the park sits on a floodplain, when the park floods the fish will look like they are jumping out of the water. Wonch Park also includes a community mural that was made at last year’s Celebrate Meridian event. Meridian Township has a rich history that contains old buildings and establishments for people to visit, and the Mayfair Bar is one of them. 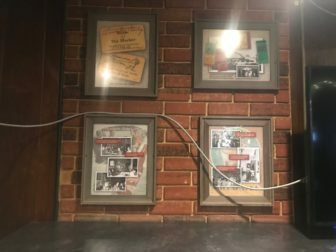 These are four pictures that hang on the walls at the Mayfair Bar in Haslett, Michigan and contains information about the bar’s history. The Mayfair Bar was established in 1934 and it has one of the oldest liquor licenses in the county. The bar was first opened on Lake Lansing and according to the current owner, Brett Story, Mayfair used to be a high-class dance venue off the water. The bar moved to its current location after the first one burned down. Story says that the bar is known for its burgers and ice-cold beers. He says his bar has the coldest beer in town. Five years ago, he added a rooftop deck that overlooks Lake Lansing. Story says that it is a very popular spot to go to during the summertime. Lake Lansing, which was known as Pine Lake, is the largest lake in Ingham County. Lake Lansing is the largest body of water in Ingham County. 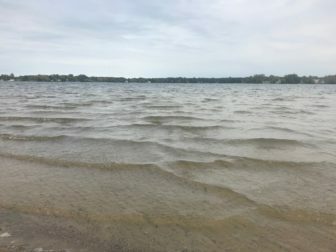 Located in Haslett, Lake Lansing runs 1.181 miles and is 34 feet deep. In the early 1900s the Lake was known as Pine Lake and it was used as a recreational site. It even housed an amusement park. Two parks surround Lake Lansing: Lake Lansing North and Lake Lansing South. The south side of the park contains the beach area. It includes pedal boat rentals, picnic shelters, sand volleyball courts, a playground and many more. The north side includes two additional playgrounds, a basketball court and hiking trails. Nearby is also a boat launch where there is easy access for people to get their boat on the lake. Dogs are prohibited on Lake Lansing South, and on Lake Lansing North dogs required to be kept on a leash. The self-guided “selfie” tour contains other places to check out, like the Okemos Community Church Bell, the Camelback Bridge and more. For more information and places to visit, check out Meridian Township’s website.